August 8, 2012 - A modified Boeing Blended Wing Body research aircraft designated the X-48C flew for the first time on Tuesday at NASA's Dryden Flight Research Center at Edwards Air Force Base in California. The remotely piloted X-48C aircraft took off at 7:56 a.m. Pacific Daylight Time and climbed to an altitude of 5,500 feet before landing 9 minutes later. The X-48C is a scale model of a heavy lift, subsonic vehicle that forgoes the conventional tube-and-wing airplane design in favor of a triangular aircraft that effectively merges the vehicle's wing and body. Boeing and NASA believe the BWB concept offers the potential over the long-term of significantly greater fuel efficiency and reduced noise. "Working with NASA, we are very pleased to enter into the next flight-test phase of our work to explore and validate the aerodynamic characteristics and efficiencies of the Blended Wing Body concept," said Bob Liebeck, a Boeing Senior Technical Fellow and the company's BWB program manager. "In our earlier flight testing of the X-48B, we proved that a BWB aircraft can be controlled as effectively as a conventional tube-and-wing aircraft during takeoffs and landings and other low-speed segments of the flight regime," Liebeck said. "With the X-48C, we will be evaluating the impact of noise shielding concepts on low-speed flight characteristics." The X-48C is a modified version of the X-48B aircraft, which flew 92 times at NASA Dryden between 2007 and 2010. The X-48C is configured with two 89-pound thrust turbojet engines, instead of three 50-pound thrust engines on the B-model; and wingtip winglets have been relocated inboard next to the engines on the C-model, effectively turning them into twin tails. The aft deck also was extended about 2 feet at the rear. "We are thrilled to get back in the air to start collecting data in this low-noise configuration," said Heather Maliska, NASA Dryden's X-48C project manager. The modified test vehicle was designed by Boeing and built by Cranfield Aerospace Ltd., in the United Kingdom, in accordance with Boeing requirements. While Boeing continuously explores and applies innovative technologies at its own expense to enhance its current and next-generation products, the X-48C flight-test research is an example of how the company also is looking much farther into the future at revolutionary concepts that offer even greater breakthroughs in the science of flight. "Boeing has been a leader in technology and aerospace for almost 100 years. Our employees work to solve big challenges and create complex, highly capable systems, from today's 787 Dreamliner airplane and P-8A Poseidon multi-mission military aircraft to the X-48C, which explores ideas for future advances. Every day our team is building on our legacy of groundbreaking technical achievements that have improved life for people worldwide," said John Tracy, Boeing chief technology officer and senior vice president of Engineering, Operations & Technology. Engineers from Boeing Research & Technology, the company's central research, technology and innovation organization, will be working closely with NASA engineers during flight tests of the X-48C, which are expected to continue throughout 2012. As handling qualities of the X-48C will be different than those of the X-48B, the project team developed flight control software modifications, including flight control limiters to keep the airplane flying within a safe flight envelope. With a 21-foot wingspan, the 500-pound aircraft is an 8.5 percent scale model of a heavy-lift, subsonic airplane with a 240-foot wingspan that possibly could be developed in the next 15 to 20 years for military applications such as aerial refueling and cargo missions. The X-48C has an estimated top speed of about 140 miles per hour, with a maximum altitude of 10,000 feet. The X-48C project team consists of Boeing, NASA, Cranfield Aeropace, and the U.S. Air Force Research Laboratory. 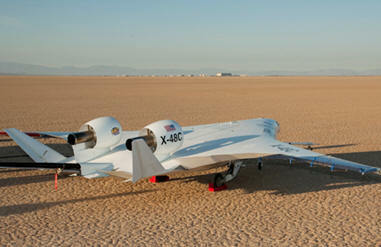 Boeing and NASA's Aeronautics Research Mission Directorate are funding X-48 technology demonstration research. The effort supports NASA's Environmentally Responsible Aviation project, which has goals to reduce fuel burn, emissions and noise of future aircraft.